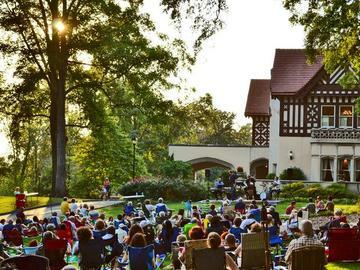 Callanwolde's Jazz on the Lawn outdoor series showcases a lineup of Atlanta’s jazz treasures with a mix of classic and contemporary jazz, swing, fusion, Latin and blues. Surrounded by the natural beauty of Callanwolde’s grounds it’s a great way to unwind and enjoy live music performed by some of the finest jazz artists in the Southeast. Bring a blanket and a picnic and enjoy these special concerts under the stars! "Shaken Not Stirred" reinvents the beloved music from the James Bond legacy. Ted Howe's arrangements with Karla Harris’ vivid vocals will skyrocket you through decades with 007 classics. Howe’s accomplishments in many roles as performer, arranger, composer and his powerful touch on the piano have led him to work with luminaries such as Herbie Mann, Henry Mancini, Lainie Kazan and Buddy Rich. Tickets: $15 advance purchase online. Online ticket sales end at 5 pm day of the event. At the door: General Admission $20; Seniors 62+ and Callanwolde Members $15. In case of rain, the concert will be moved to Callanwolde’s indoor courtyard. Bring your printed ticket with you for quick entry to the event. Bring a blanket or a low-backed lawn chair and a picnic, which may include alcoholic beverages if you are 21+. As a courtesy to guests, there will be no smoking, pets or high-backed chairs at this event. No ticket refunds. In case of rain, the concert will be moved to Callanwolde’s indoor courtyard. Parking is free and on-site while space is available.